The AMD A8-4500M is a mobile quad-core processor based on the Trinity architecture. Officially introduced in Q2 2012, it is the direct successor to the Llano A-series of APUs (Accelerated Processing Unit). The processing unit is manufactured in 32nm SOI and integrates a 1.9 GHz CPU (up to 2.8 GHz w/ Turbo Core) with a relatively fast Radeon HD 7640G GPU alongside a dual-channel memory controller, video de- and encoders and a northbridge. The CPU cores are based on a reworked Bulldozer architecture, called Piledriver. Although marketed as a quad-core processor, the A8-4500M includes only two modules with four integer-cores and two floating-point cores total. As a result, the CPU is not a true quad-core processor. When compared to previous Bulldozer cores, AMD has managed to improve upon the IPC (instructions per clock) performance of Trinity cores while allowing for higher clock frequencies. However, when compared to its Llano predecessor, the multithreaded performance of Trinity has only been slightly improved. The enhanced Turbo Core 3.0 feature functions well in speeding up single threaded performance, although it is still not on the same level as Intel’s Turbo Boost equivalent. Regardless, AMD has managed to include other features as well, such as the AVX extension (including FMA) and support for AES encryption. In terms of raw general performance, the A8-4500M performs similar to the Llano-based A8-3500M. Single-threaded workloads can especially benefit from the new architecture and the updated Turbo Core functionality. If compared to Intels Core-i3-series, the A8-4500M offers less performance in most cases. Nonetheless, CPU performance from the AMD processor should be sufficient for all daily workloads like Office, Internet browsing and even light video editing or gaming. The integrated DirectX 11-compatible Radeon HD 7640G offers only 256 shader cores of the Trinity chip (7660G: 384) and, thanks to Turbo Core, will operate anywhere between 497 to 686 MHz depending on the current application demand. On average, the performance of the HD 7640G GPU is comparable to a dedicated Radeon HD 7610M and is even faster than the HD Graphics 4000 as found in Intel’s Ivy Bridge. The power consumption of the A8-4500M APU is rated at 35 Watt TDP and is therefore comparable to mid-range dual-core Ivy Bridge processors. Consequently, the A8-4500M is best suited for 14-inch notebooks or larger. 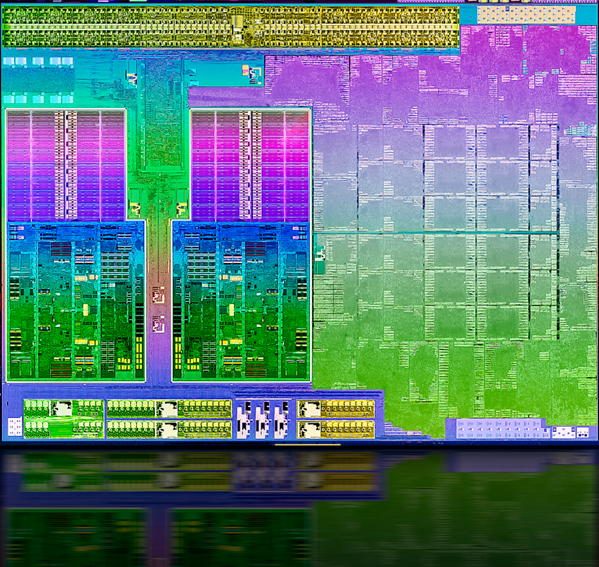 The AMD A6-4455M is a mobile ultra-low-voltage (ULV) dual-core processor based on the Trinity architecture. Officially introduced in Q2 2012, it is the direct successor to the Llano A-series of APUs (Accelerated Processing Unit). The processing unit is manufactured in 32nm SOI and integrates a 2.1 GHz CPU (up to 2.6 GHz w/ Turbo Core) with a Radeon HD 7500G GPU alongside a dual-channel memory controller, video de- and encoders and a northbridge. The CPU cores are based on a reworked Bulldozer architecture, called Piledriver. Although marketed as a dual-core processor, the A6-4455M includes only one module with two integer-cores and and floating-point core. As a result, the CPU is not a true dual-core processor. In terms of raw general performance, the A6-4455M performs significantly faster than the E-Series (e.g. E2-1800), but cannot compete with Intels ULV processors. Nonetheless, CPU performance from the AMD processor should be sufficient for all daily workloads like Office and Internet browsing, but will reach its limits in more demanding applications and multitasking. The integrated DirectX 11-compatible Radeon HD 7500G offers only 256 shader cores of the Trinity chip (7660G: 384) and, thanks to Turbo Core, will operate anywhere between 360 to 497 MHz depending on the current application demand. On average, the performance of the HD 7500G GPU should be somewhere between the Llano-based Radeon HD 6620G and the HD Graphics 4000 as found in Intel’s Ivy Bridge. The power consumption of the A6-4455M APU is rated at 17 Watt TDP and is therefore comparable to Intels ULV-processors. Consequently, the A6-4455M is best suited for thin-and-light notebooks.